March 6, 2017, 10:56 a.m. The closed discussion platform shuts out the noise of Twitter’s eggs and trolls and is betting on — gasp! 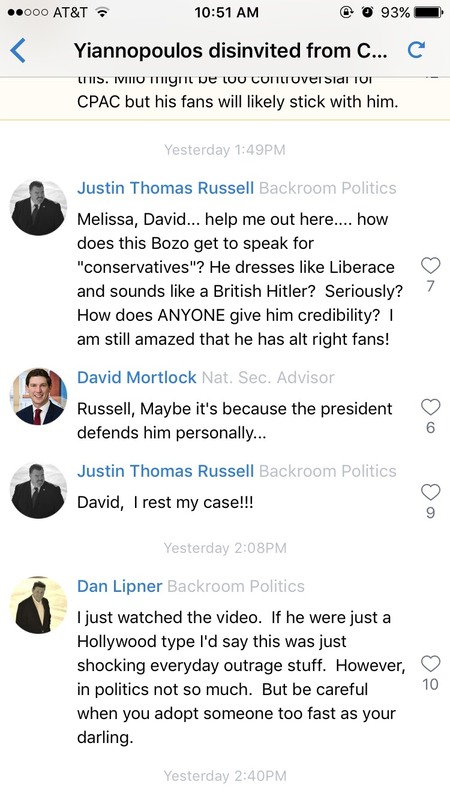 — the value of government and media elites talking to one another. By Shan Wang @shansquared March 6, 2017, 10:56 a.m.
Sidewire — proclaiming to be “where experts chat in public” — wants to squeeze out the trolling and abuse prevalent on platforms like Twitter and clear a space for calm discussion free of social media “noise.” It limits chat participants on the platform to vetted “newsmakers” and trims conversation topics to just a handful of the most consequential or debateworthy news events. Launched in September 2015, it now hosts around 800 “verified experts,” around a third of whom are journalists, in its politics vertical, and around 100 in its newer tech vertical. 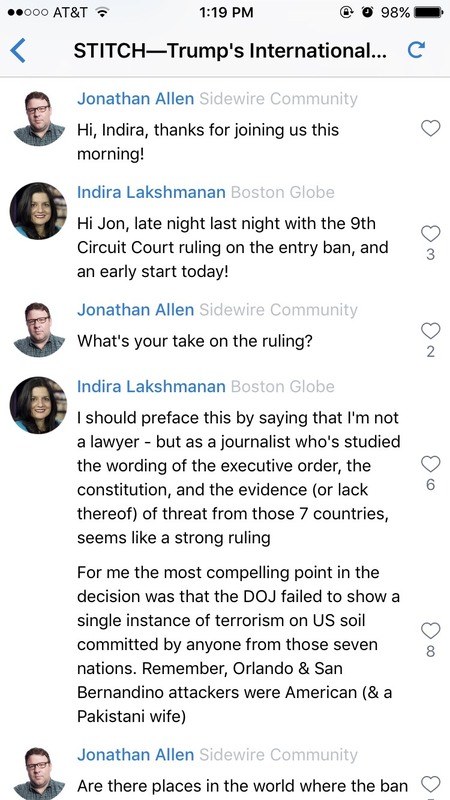 Sidewire invites “newsmakers” to the platform, and they can in turn invite others (if you qualify as an “expert” of some sort, you can apply to join here). “Maybe it’s because the president defends him personally,” replied the former director of international economic affairs under the Obama administration. “Can I play devil’s advocate for a moment: He’s a performance artist and being disinvited plays into his ‘art,'” Vice News’ Washington bureau chief Shawna Thomas offered. 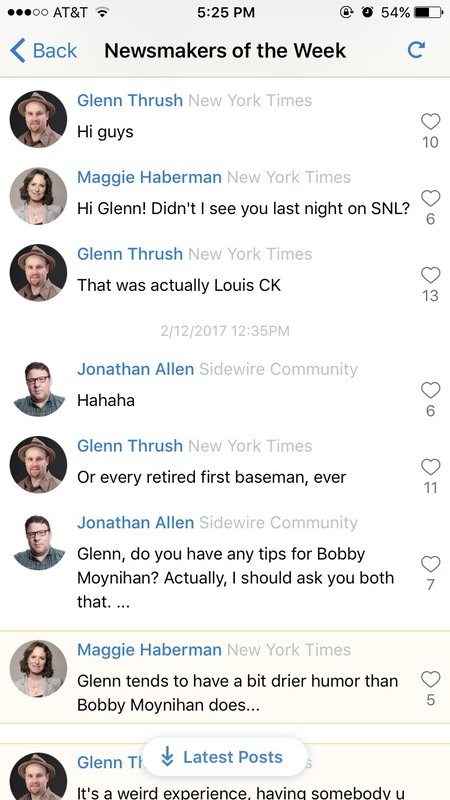 Sidewire staffers curate chats by posting news stories and ping relevant people on the platform to come discuss them. Those approved to use Sidewire can also open up their own chats around a news topic, inviting other people who they think would be insightful participants. The relative civility on the platform is due in part to Sidewire’s focus on only the top couple of political or tech stories in the news cycle each day, despite the current administration’s turbulent, story-dense first weeks in office. It’s also due to the fact that readers can’t do much to weigh in except “like” the statements made by newsmakers. Vice’s Thomas, who was invited to Sidewire last year while she was at NBC News’s Meet the Press, said that the platform hasn’t exactly been part of her “regular social media diet,” but she’s found push alerts from the app about new chats and Q&As useful as a way of finding new sources for her own work. Only a few chats take place on any given day; some days there’s just one. Sidewire staffers highlight the best insights from within each day’s chats (the biggest day so far was November 8, Election Day, with 14 total chats). 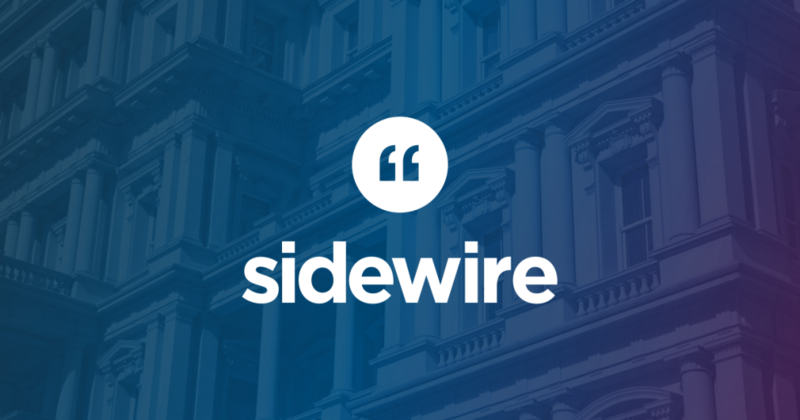 In anticipation of a big policy decision or a scheduled announcement, Sidewire might line up a set of newsmakers and schedule a chat in advance. 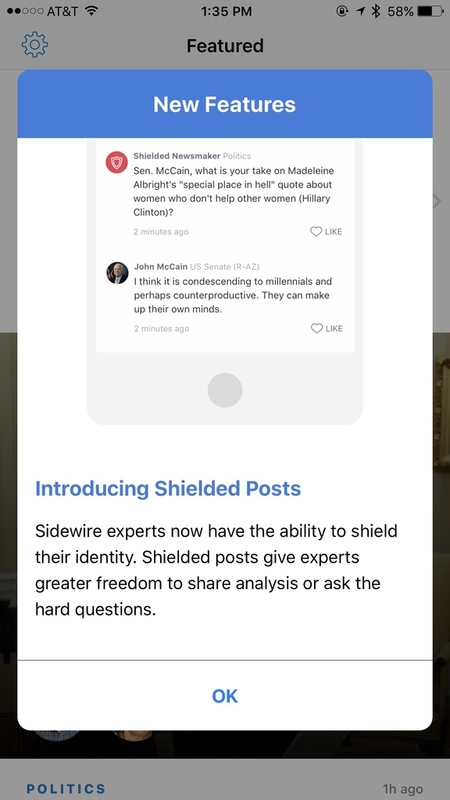 Sidewire recently started offering the option of “shielded” posts that hide the identity of the newsmaker weighing in. (So far, this hasn’t resulted in any increased trolling on the platform.) Its next area of focus, said Sidewire CEO Andy Bromberg, will include ways to let newsmakers get feedback from readers within Sidewire itself, while still keeping trolls at bay. On Twitter and even Facebook, the news and takes and jokes (as well as the terrible abuse) come at you fast and furious, giving users an infinite firehose of stuff to consume. But is there enough content to read on Sidewire to keep people coming back? “We care more about being a place where the content’s created than where it’s consumed,” Bromberg said. Sidewire chats can be shared on Twitter and Facebook, embedded into other sites, and followed on Facebook Messenger. 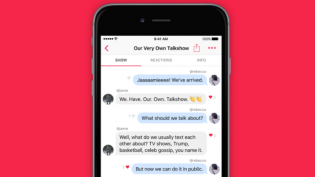 Talkshow, another service focused on public discussion, shut down six months after launch. And Twitter Moments, the platform’s attempt to offer easier-to-understand slideshows around notable events, was demoted to a broader “explore” tab in the app in January, and often fails to capture well the essence of an event (see: its confusing moment from this year’s Oscars). Will Sidewire succeed where similar efforts have stumbled? Bromberg declined to disclose how many users (i.e., non-newsmakers) Sidewire has, but said most of them are in D.C., New York, and San Francisco, with a fairly evenly split between men and women. There’s also “an amazing community in Iowa,” where Sidewire officially launched its app back in 2015. And there are “strong coalitions of local newsmakers in a lot of the early primary states,” Bromberg said. Sidewire is also looking to add verticals in sports and entertainment. As criticism of journalistic navel-gazing mounts and President Trump positions many news organizations as enemies, I asked Bromberg if a highly vetted discussion app featuring only the “top experts” might not appeal to a particularly broad audience — especially if the audience is purposefully held at arm’s length. POSTED March 6, 2017, 10:56 a.m.
Wang, Shan. "Sidewire is civil, thoughtful, and either exactly right or exactly wrong for this political moment." Nieman Journalism Lab. Nieman Foundation for Journalism at Harvard, 6 Mar. 2017. Web. 18 Apr. 2019. Wang, Shan. "Sidewire is civil, thoughtful, and either exactly right or exactly wrong for this political moment." Nieman Journalism Lab. Last modified March 6, 2017. Accessed April 18, 2019. https://www.niemanlab.org/2017/03/sidewire-is-civil-thoughtful-and-either-exactly-right-or-exactly-wrong-for-this-political-moment/.